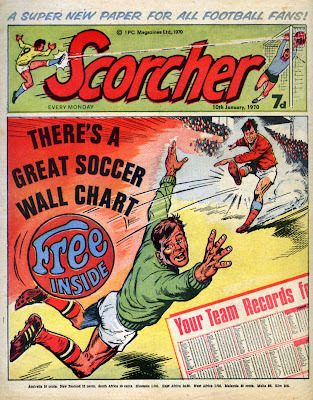 Forty years ago today, on January 3rd 1970, IPC launched the first issue of their football weekly comic Scorcher. Although IPC had already inherited Smash! 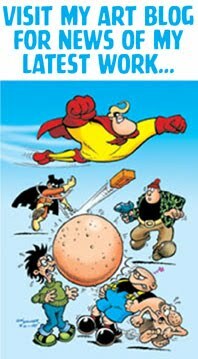 from Odhams and Lion, Valiant, Buster, and Tiger from Fleetway in 1969 Scorcher was the first new boys title from the company. The new weekly was heralded in a full page teaser ad in the IPC boys' comics dated January 3rd (on sale just before Christmas 1969). Without further ado, Scorcher was launched the following week (dated Jan. 10th but on sale Jan. 3rd) accompanied by four page announcements in several IPC titles and short tv ads shown at teatime. It was an impressive debut issue. An eye-catching logo atop a strong cover image by Mike Western, and a useful free gift whereby readers could plot their team's progress throughout the season on a wallchart graph. 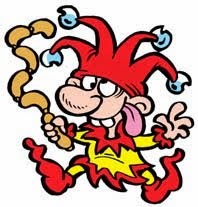 IPC were clearly keen to tap into what they perceived as a large fanbase for football reading matter. Several months earlier they'd launched the Shoot! football magazine, and had also just published several regional one-off soccer mags. Scorcher was IPC's first solid single-theme comic, breaking away from the usual anthology of war/detective/western/sci-fi etc. Theme comics would become the template for later titles such as Battle (war), 2000AD, (sci-fi) and Scream! (horror). 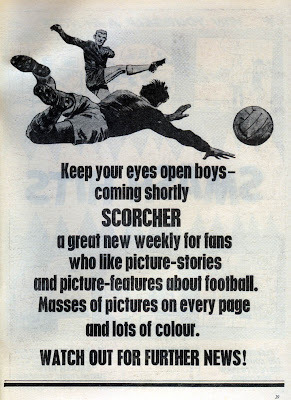 Inside, Scorcher No.1 featured a combination of serial strips and a few football features. It also included one humour strip, - Sub, by genius cartoonist Ken Reid. Although IPC had curtailed the comic horror of Ken's Nervs strips, (and stopped him signing his pages as per new company policy) Sub was still a funny strip. As you'll have noticed, Sub was embellished in a grey wash, which does it no favours when subjected to the cheap newsprint that Scorcher was printed on. 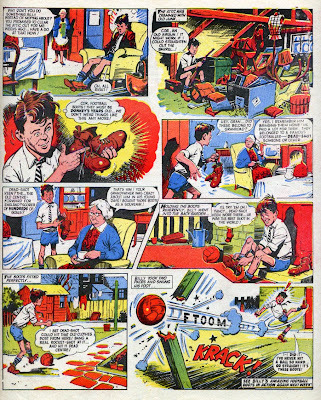 The technique was applied to several other strips in the comic, leading me to suspect that Scorcher was originally intended to be produced with the slick photogravure method that IPC later used on their next footie title, Score 'n' Roar. 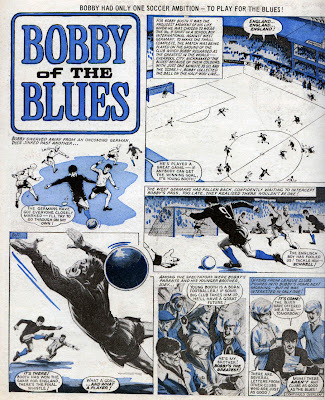 Bobby of the Blues looked particularly odd with its clash of grey wash and spot colour. 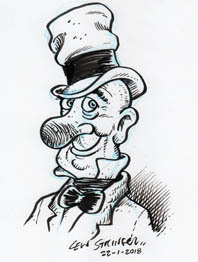 This first episode was drawn by Joe Colquhoun, but taken over by another artist from issue two, suggesting Joe's pages were produced for Scorcher in the dummy issue stage. By the time Scorcher was published Joe would be too busy illustrating two full colour pages an issue of Kid Chameleon for IPC's upcoming Cor!! weekly. The daftest story in Scorcher has to be Kangaroo Kid. Even good artwork by John Stokes couldn't lift this silly tale of a boy who'd been raised by kangaroos and who becomes a great footballer because his leg muscles are over-developed due to him imitating the creatures who raised him... but the Tarzan knock-off is so absurd it's difficult to actually dislike it! 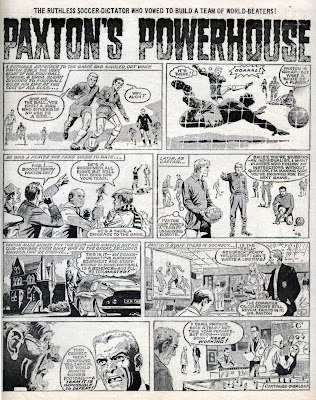 Paxton's Powerhouse was another strip drawn by John Stokes, - in issue 1 at any rate. 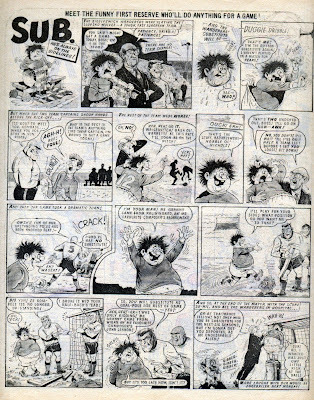 By the second issue Barrie Mitchell had taken over so presumably Paxton was another strip produced months earlier for the dummy issue, with the original artist being unavailable once it got the green light. Again, wash work is wasted on the cheap newsprint, and it's a technique that IPC dropped after a few weeks. 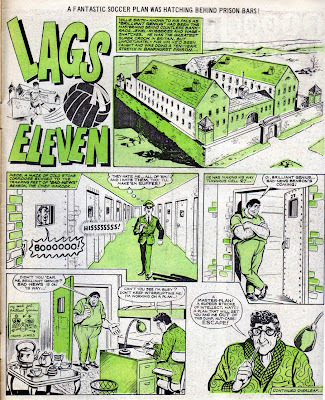 Lags Eleven had artist Doug Maxted doing what he did best, - an adventure comedy serial. Here the character of Brilliant Genius is based on the criminal mastermind character that Peter Sellers played in the 1960 Ealing comedy Two Way Stretch. 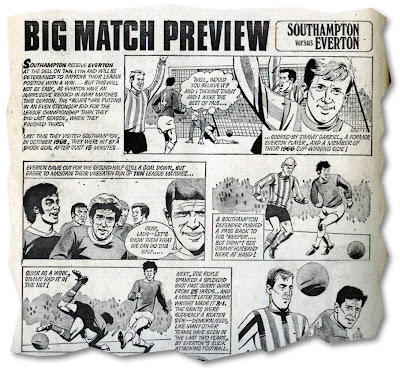 At the back of the comic was a nice relevant item called Big Match Preview. Every week Scorcher would debate an upcoming match by looking back at how the same two teams fared against each other the last time they met. 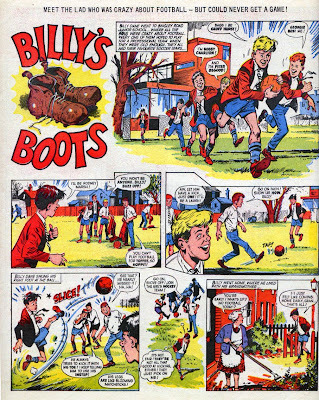 The comic also featured several other strips but the one that really had legs was Billy's Boots. Editor Dave Hunt must have sensed this was something special as he awarded it the full colour centre spread. With artwork by Mike Western on the first two issues, Billy's Boots was off to a great start. It's a story that appealed to many readers, from the boy who wants to be a professional footballer, to the less able kids who simply want to play better. Sure enough, Billy's Boots became such a great success that it continued for years after in Tiger... and beyond. But that's a story for another blog! Scorcher was an enjoyable comic, even for people who hated football like me! It still has its fans today, but back in the 1970s there weren't enough to sustain it for very long. After 18 months it absorbed the ailing Score weekly and then Scorcher itself merged into Tiger in 1974. A four year run is good, but not spectacular. It seems that, with the single exception of Roy of the Rovers, comics with all-football themes don't exactly fill the stadium. Here's a cross-reference of all the series that Ken Reid did for Scorcher. Have fun! I remember SCORCHER as if it was yesterday. (Or should that be 'as if it were yesterday'? - I can never remember.) Funnily enough, I wasn't into football either, but I loved BILLY'S BOOTS. What a great site you have here Lew - a real treasure chest. On a different matter, if I may? 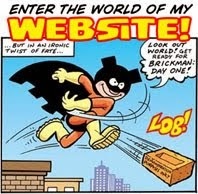 I think it was on this site some time back that I read something about the comic known as SUPER DC, which was like a DC COMICS version of Odham's FANTASTIC. Denis Gifford in one of his books says that there were 14 issues. In the same book, however, he says that there were 91 issues of FANTASTIC when, in fact, there were only 89. (I've got them all.) Therefore, I'm not sure if he's right about the issue count of SUPER DC. 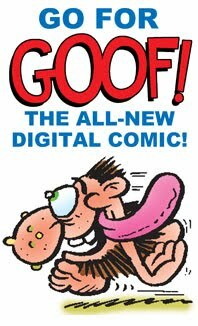 I've got 13 issues - would you (or anyone) know exactly how many issues there were of this seemingly forgotten comic? More power to your drawing elbow, Lew. Great article as always! My favourite was Billys Boots. Hopefully it will be collected like recent editions of old strips. 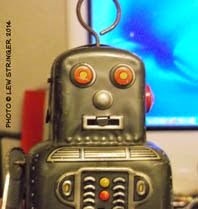 I really enjoy your blog Lew-its one of my daily reads! Kid, I only have 12 issues of Super DC and was told by the seller that it was a complete set so you've disproved that with your issue 13. Considering that, I suppose it's likely there MAY have been 14 issues but I'm not sure. Unless Gifford had counted the annual by mistake. Thanks Mike. I'll be posting a blog on Billy's Boots here soon! I thought Billy's Boots made its debut in Tiger - thanks for this post. 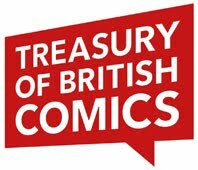 The scans are great - I am planning a weekend on British comics on my own blog for sometime this winter - I'd like to interview you by email for this. What I'll do, Lew, is scan the cover of #13 and send it to you, so that you'll recognize it should you ever see it. (Quite apart from the number 13 on the cover, that is.) It'll take me a week or so to dig through my cupboard and find it, 'though. 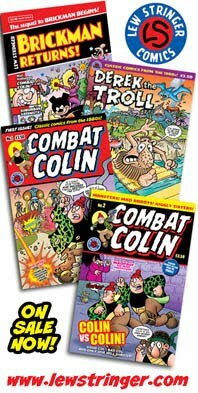 As for Denis, I don't think he was including the Annual - he didn't seem to be with the other comics. In the case of FANTASTIC, if he'd included the Annuals and the 1968 Summer Special he'd have come up with 94 issues, not 91. Another problem with his 'price guides' was that he tended to give the values of comics as what he'd be prepared to pay, rather than what dealers were actually charging for them, so from that point of view, they were virtually useless. Lovely photos 'though. Was there also another magazine-comic called Match? I seem to recall my brother getting it with Shoot. Match is still being published John. I don't think it features any comic strips. I am sure there was a story called " Once" about a player who only ever did anything notable once!.....eg win a league or play for England etc..... Am I correct in thinking this appeared in scorcher? It doesn't ring a bell, Graham, and it's not mentioned in the Scorcher listings in Steve Holland's Fleetway Index.